An efficient and reliable transport and logistics system is of great importance to the development of an export-based economy like Vietnam. However, how Vietnam can ensure an efficient transport and logistics system that can promote current and future economic growth models is not simple. Mr. Ousmane Dione, World Bank Country Director for Vietnam, said, Vietnam is one of the most open economies in the world, with its trade-to-GDP ratio at above 200%. As tariffs on international trade have been sharply reduced and manufacturing costs have increased, Vietnam’s export competitiveness is increasingly dependent on factors such as quality, productivity, efficient supply chains, and especially lower transport and logistics costs. At the same time, Vietnam’s middle class is expanding, and consumption is rising, especially in rapidly urbanizing areas, with growing demand for goods movement. Since 2000, traffic volume by freight ton-km has increased at an annual rate of almost 10%, much faster than the gross domestic product (GDP) growth, which grew at an average rate of 6.4% per annum. Such rapid growth of traffic, which is the result of Vietnam’s economic growth, also puts immense pressure to further develop and maintain quality infrastructure, and to meet the increasing and sophisticating demand for reliable transport and logistics services. So, how can Vietnam ensure an efficient and reliable transport and logistics system that can promote current and future economic growth models? Mr. Ousmane Dione pinpointed three factors that ensure efficient and reliable transport and logistics: Adequate backbone infrastructure; efficient and reliable transport and logistics services; and seamless multimodal network for lower transport costs and sustainability. The Government of Vietnam has made remarkable progress in transport infrastructure development over the past decades. Vietnam’s road network has now extended to nearly 400,000 km, with almost all commune centers connected by all-weather roads. Despite this impressive improvement in rural access, development in critical backbone, interurban connectivity has been relatively modest. For instance, in 2000 - 2016, the length of critical national transport infrastructure, national highways and national inland waterways, grew 2.9% and 0.3% annually, respectively. The density of expressway network in Vietnam is 3 km per 1,000 square km, compared with 8 km in India and 13 km in China. To address this gap, the Government has set a right goal of giving priority on developing the North-South Expressway. The inland waterway network plays a key role and transports huge volumes of goods, accounting for nearly 20% of the total tonnage in tons-kilometers in 2016. Currently, this network seriously lacks investment. According to the WB's review, in the 2011 - 2015 period, the inland waterway sector received about 2-3% of the annual transport sector budget, but this rate decreased to only 1.2% for the period of 2016-2020, which is likely to be inadequate to support necessary expansion and maintenance. After decades of development, the network length that can handle barges larger than 300-ton capacity remains less than 30% of the total 7,000 kilometers of national waterways, a very low proportion compared to most successful commercial waterways in the world. This fact points to a need for continued and significant investment in critical backbone infrastructure, which are also key trade corridors. That high level of investment needs must be met through strategic allocation of scarce public resources and through mobilization of private sector engagement in financing and service delivery. Over the past two decades, the supply of transport services has increased significantly. Vietnam is rapidly motorizing, and the number of registered trucks reached over 1.1 million. Liner Shipping Connectivity Index (LSCI) grew from 12.9 in 2004 to 68.8 in 2018. However, according to the WB’s survey and analysis, although there is a growth in number, the quality of transport service is still a matter of concern. An average truck operator employs three people and has an annual turnover of less than US$500,000 or VND11 billion; and the current truck fleet is dominated by small, less than 5-ton vehicles. Such limitation to scale in the industry causes inefficiency because of high shares of empty backhaul and high transport costs per ton-km. 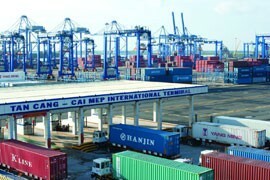 Intermediary logistics service sector, such as truck brokerage, is underdeveloped in Vietnam. Inland waterway operators typically rely on small-sized vessels of about 100-300 tons, constrained by waterway capacity bottlenecks due to narrow channels and low clearance bridges, as well as limited cargo handling capacity in river ports. This suggests that, while much of development in transport and logistics services will be led by the private sector, possibly truck or warehousing operators, the Government needs to create an enabling environment for their development. The Government can create financing opportunities for them to develop well-performing truck operators, eliminate infrastructure constraints to induce private investments into their fleet, and encourage international service providers with many new technologies to cooperate with local operators. This will allow such critical services to increase and improve in standards, with lower logistics costs and emissions. To minimize these shortcomings, according to the WB, Vietnam needs to build a multimodal transport network to create a seamless connectivity to reduce transport costs and enhance sustainability. Based on 2018 tonnage figures, inland waterways transport accounts for about 17% of the national freight transportation share, while trucking and coastal shipping account for about 77% and 5%, respectively. In addition to the advantage of an increasingly developed road network, Vietnam is fortunate to have 26,500 km of navigable waterways and over 3,000 km of coastline, which should be leveraged further. International experience has shown that waterways and coastal shipping can lead to lower logistics and environmental costs compared to individual trucking. A 40-foot container’s cost can be about as low as 10% of road transport cost if the consolidation brings about adequate economies of scale. Road transport emits 2-3 times the emissions of waterways. In addition to improving road transport performance, the WB said, Vietnam needs to enhance multimodal transport, build a consistent road transport network, inland waterways and sea routes. There is a need for optimal allocation of governmental budget for transport modes in terms of investment costs and recurrent expenditures. Multimodal transport will help strengthen connectivity and improve network resilience, while it will also help reduce greenhouse gas emissions at the national level.